Date of death May 11, 2001 Santa Barbara, Santa Barbara County, California, U.S.A.
Adams was an advocate for environmentalism and conservation, a lover of fast cars, technological innovation and the Apple Macintosh, and a radical atheist. Adams attended Primrose Hill Primary School in Brentwood. At nine, he passed the entrance exam for Brentwood School. Griff Rhys Jones was a year below him, and he was in the same class as Stuckist artist Charles Thomson. He attended the prep school from 1959 to 1964, then the main school until December 1970. Adams was 6 feet (1.8 m) by age 12 and stopped growing at 6 feet 5 inches (1.96 m). His form master, Frank Halford, said Adams's height had made him stand out and that he had been self-conscious about it. His ability to write stories made him well known in the school. He became the only student ever to be awarded a ten out of ten by Halford for creative writing, something he remembered for the rest of his life, particularly when facing writer's block. In 1979 Adams and John Lloyd wrote scripts for two half-hour episodes of Doctor Snuggles: "The Remarkable Fidgety River" and "The Great Disappearing Mystery" (episodes eight and twelve). John Lloyd was also co-author of two episodes from the original Hitchhiker radio series ("Fit the Fifth" and "Fit the Sixth", also known as "Episode Five" and "Episode Six"), as well as The Meaning of Liff and The Deeper Meaning of Liff. According to Adams, the idea for the title occurred to him while he lay drunk in a field in Innsbruck, Austria, gazing at the stars. He was carrying a copy of the Hitch-hiker's Guide to Europe, and it occurred to him that "somebody ought to write a Hitchhiker's Guide to the Galaxy". He later said that the constant repetition of this anecdote had obliterated his memory of the actual event. In 1980 Adams began attempts to turn the first Hitchhiker's novel into a film, making several trips to Los Angeles, and working with Hollywood studios and potential producers. The next year, the radio series became the basis for a BBC television mini-series broadcast in six parts. When he died in 2001 in California, he had been trying again to get the movie project started with Disney, which had bought the rights in 1998. The screenplay got a posthumous re-write by Karey Kirkpatrick, and the resulting film was released in 2005. Adams played the guitar left-handed and had a collection of twenty-four left-handed guitars when he died (having received his first guitar in 1964). He also studied piano in the 1960s with the same teacher as Paul Wickens, the pianist who plays in Paul McCartney's band (and composed the music for the 2004–2005 editions of the Hitchhiker's Guide radio series). Pink Floyd and Procol Harum had important influence on Adams' work. Adams was a founder-director and Chief Fantasist of The Digital Village, a digital media and Internet company with which he created Starship Titanic, a [[Software and Information Industry Association#CODiE Awards|Codie award]]-winning and BAFTA-nominated adventure game, which was published in 1998 by Simon & Schuster. Terry Jones wrote the accompanying book, entitled Douglas Adams' Starship Titanic, since Adams was too busy with the computer game to do both. 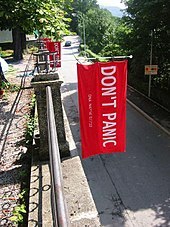 In April 1999, Adams initiated the h2g2 collaborative writing project, an experimental attempt at making The Hitchhiker's Guide to the Galaxy a reality, and at harnessing the collective brainpower of the internet community. It was hosted by BBC Online from 2001 to 2011. Adams was a Macintosh user from the time they first came out in 1984 until his death in 2001. He was the first person to buy a Mac in Europe (the second being Stephen Fry – though some accounts differ on this, saying Fry bought his Mac first. Fry claims he was second to Adams). 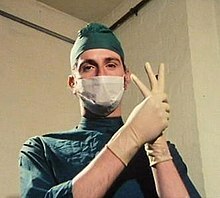 Adams was also an "Apple Master", celebrities whom Apple made into spokespeople for its products (others included John Cleese and Gregory Hines). Adams's contributions included a rock video that he created using the first version of iMovie with footage featuring his daughter Polly. The video was available on Adams's .Mac homepage. Adams installed and started using the first release of Mac OS X in the weeks leading up to his death. His very last post to his own forum was in praise of Mac OS X and the possibilities of its Cocoa programming framework. He said it was "awesome...", which was also the last word he wrote on his site. Adams used email to correspond with Steve Meretzky in the early 1980s, during their collaboration on Infocom's version of The Hitchhiker's Guide to the Galaxy. While living in New Mexico in 1993 he set up another e-mail address and began posting to his own USENET newsgroup, alt.fan.douglas-adams, and occasionally, when his computer was acting up, to the comp.sys.mac hierarchy. Challenges to the authenticity of his messages later led Adams to set up a message forum on his own website to avoid the issue. In 1996, Adams was a keynote speaker at the Microsoft Professional Developers Conference (PDC) where he described the personal computer as being a modelling device. The video of his keynote speech is archived on Channel 9. Adams was also a keynote speaker for the April 2001 Embedded Systems Conference in San Francisco, one of the major technical conferences on embedded system engineering. Adams died of a heart attack on 11 May 2001, aged 49, after resting from his regular workout at a private gym in Montecito, California. Adams had been due to deliver the commencement address at Harvey Mudd College on 13 May. His funeral was held on 16 May in Santa Barbara. 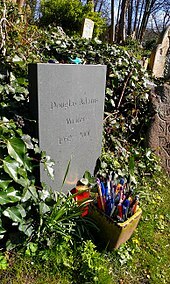 His ashes were placed in Highgate Cemetery in north London in June 2002. A memorial service was held on 17 September 2001 at St Martin-in-the-Fields church, Trafalgar Square, London. This became the first church service broadcast live on the web by the BBC. Video clips of the service are still available on the BBC's website for download. One of his last public appearances was a talk given at the University of California, Santa Barbara, Parrots, the universe and everything, recorded days before his death. A full transcript of the talk is available, and the university has made the full video available on YouTube. In 2011, over 3,000 people took part in a public vote to choose the subjects of People's Plaques in Islington; Adams received 489 votes. On 11 March 2013, Adams's 61st birthday was celebrated with an interactive Google Doodle. What's the good word on Douglas Adams?